Don’t you just love baskets? I don’t think you can ever have too many! We have them all around my house, holding various things; Pens, Paint, WIPs, and of course, yarn! This post contains affiliate links. By purchasing through an affiliate link, I will receive a small commission for bringing you that link. This is at no extra cost to you. >> Love this mug from 3amgracedesigns? Get it HERE. Use code Blackstone to save 20% on mug purchases!! I’ve been seeing the Hoooked Zpagetti yarn on Instagram a lot lately. I immediately knew I would need to try making a basket with it. I knew exactly the theme: Nautical! I really have the Summer feels right now and I don’t want Summer to end, so I’m sprucing my house up with Summer themed items. But, once I went to order my yarn from Love Crochet, the Navy Blue yarn was gone. Bummer! I quickly rethought how to make this work and I grabbed the Coral, Anthracite, and White. Yarn review coming soon! 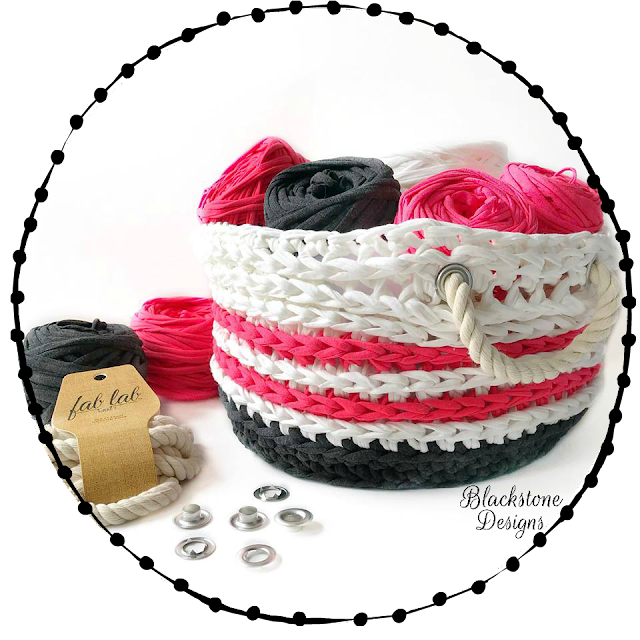 So, let’s get to making a basket of your very own. 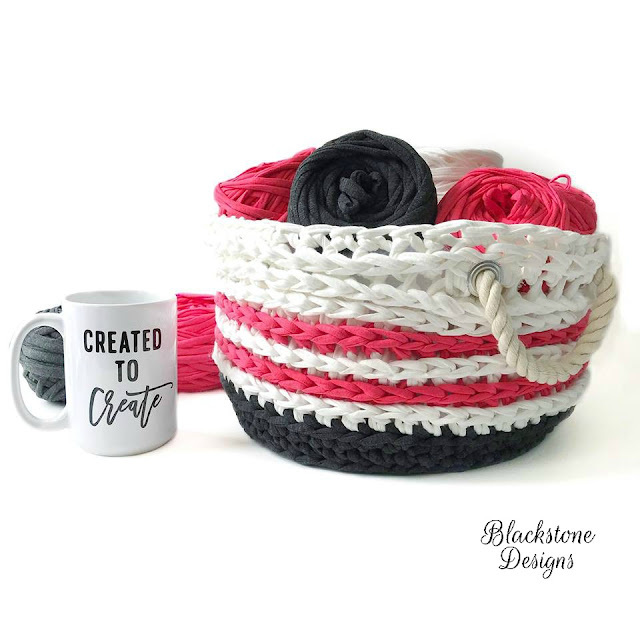 Side Note: This yarn did not hold stiff for this basket as written, so if you’re looking for it to hold shape, I have a couple of suggestions: 1) Use plastic canvas (or cardboard) and line the inside of the basket to hold it’s shape. 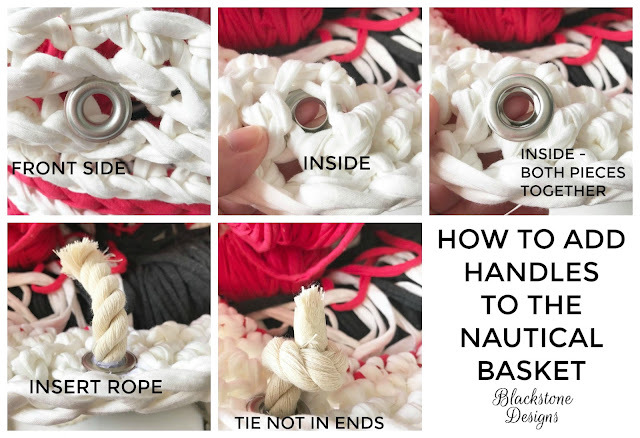 2) Use a smaller hook and make the base wider, by continuing the increases on the base. You would need to reconfigure the handle placement if you change the stitch counts. I am going to stuff mine with yarn, so I wasn’t as concerned about this. Third Loop Only (TLO) = The third loop can be found on the backside of a hdc; it runs parallel to the front and back loops. AKA Camel Stitch. For this pattern, you will tilt the front and back loop forward to work in the third loop. Insert grommets, as instructed on package, into the handle holes made on round 19. Cut rope into 2- 20” pieces. Insert handles into grommets and tie a knot into each end.